More than 500 customers attended an event to mark the official opening of the stunning new Porsche Centre East London on 18 June 2015. 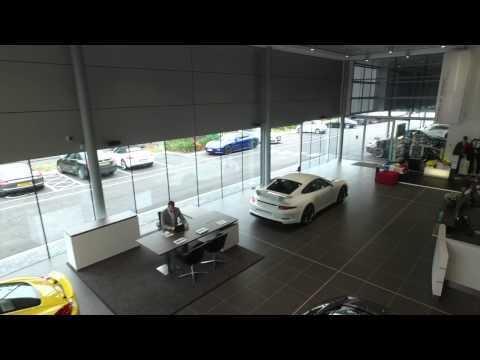 The team, which had out-grown its original Stratford home, now enjoys a new 18-car showroom, 10-bay workshop and best of all, enough room to park clients and staff on site. Ivan Howell, Porsche East London Centre Principal, hosted the evening delivering a speech for guests about the new centre before Chris Craft, Porsche GB Managing Director presented Jardine Motors’ former CEO Mark Herbert with an official opening plaque. Guests enjoyed a unique array of cars, including the 917 Le Mans Racer, 918 Spyder hybrid supercar and a full sized model of the 2015 Le Mans-winning 919. The Centre's 2015 restoration project, a 1972 911 2.2 Turbo, was also on show display along with a selection of new and Porsche Pre-Owned vehicles. Speaking about the launch, Imran Patel, Sales Executive, said: "It was a real privilege to show off our amazing new premises. I have not been with the brand long, so it was really nice to get to meet customers who are real Porsche enthusiasts." Scott Daniels, Service Advisor, added: "I would say the event was a huge success. There was a real buzz of excitement in the showroom, which you could see on the faces of our guests. We all enjoyed the evening as much as our customers!"